I suspect claustrophobia likely disturbs more people than actually realize it. Feeling trapped without any real means of escape, either physically or metaphorically, is certainly something we can all agree is unpleasant at the least. In extreme cases, your breath gets short and quick; you begin to feel dizzy and flush; and you're likely to pass out from the sheer intensity of it all. If you have yet to go through a claustrophobic episode, fear not, director Rodrigo Cortes has made a movie just for you. Buried is 95 uninterrupted minutes stuck in a cramped, wooden box somewhere under the ground in Iraq, with only a Zippo lighter and cellphone for light, communication and potential salvation. 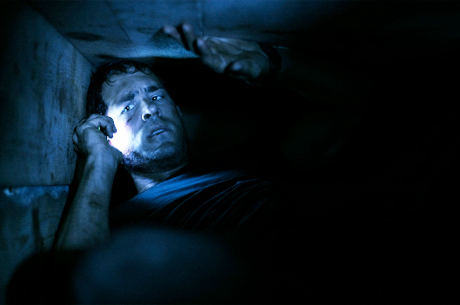 Now, if you've got to be buried alive, you couldn't ask for better company than Ryan Reynolds. Naturally, nobody wants to see an actor as likable and handsome as Reynolds perish in such a manner, so the urgency is elevated just by his casting. He can't get by on looks and charisma alone though - the premise demands that Reynolds push himself as an actor in a way that I don't think he has ever had to in his entire career. Fortunately, Reynolds gets the fear, the desperation and the hope just right to keep us trapped in that box with him the entire time. Reynolds plays a contract truck driver in Iraq mistaken for a soldier and kidnapped for ransom. He spends most of his time in the box calling anyone who might be able to get him out and pleading with his captors. The somewhat damning undertone about America and the Iraq war could have been buried a little deeper within the subtext, but Cortes pulls off a pretty impressive feat with this hard sell.